The Essential Business Services You Need Under One Roof. Founded by Denise Robinett, Essential Business Services (EBS) has the team to help Power Your Business to new levels. With over 28 years of business experience, Denise Robinett has senior management experience working in higher education, non-profit organizations, real estate development, retail services and mortgage banking. Throughout her career, Denise has earned many awards and distinctions for productivity, leadership and operational excellence. Denise puts her broad-based experience to work for her clients at Essential Business Services, offering accounting, payroll, tax preparation and representation, also available bundled with marketing and business consulting support. She is a Certified QuickBooks ProAdvisor, a Certified Small Business Coach, and an IRS Enrolled Agent. Denise was recently appointed a National Tax Practice Institute Fellow,® completing a demanding three-part curriculum to effectively represent clients before all administrative levels of the IRS. While earning an EA license denotes competence in taxation and the right to represent taxpayers, Fellows have made the commitment to a higher level of knowledge and excellence further setting them apart. As an Enrolled Agent (EA), Denise is a tax professional authorized to represent taxpayers before the Internal Revenue Service (IRS). 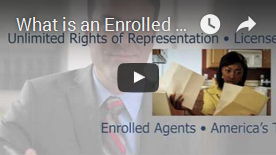 Enrolled Agents are the only tax professionals tested and regulated by the IRS. An Enrolled Agent is licensed to practice by the Federal Government and authorized to appear in place of taxpayers at the IRS. In addition to stringent testing and an extensive background investigation, Enrolled Agents are required to complete continuing professional education and adhere to a strict Code of Ethics. Because of the knowledge necessary to become an Enrolled Agent and the requirements to maintain the license, there are only about 46,000 practicing Enrolled Agents in the US. Is a federally-authorized tax practitioner. Is regulated by the US Treasury and prepares business, personal, estate and trust returns. Adheres to a Code of Ethics. Passes a comprehensive 12-hour tax exam administered by the IRS. Completes mandatory continuing education each year. Is authorized to represent taxpayers before the IRS and other taxing agencies in audits, collections and appeals. Is a specialist who can help taxpayers resolve tax problems and plan for the future. Choosing a tax preparer is an important decision for business owners. At EBS, we make the decision an easy one. We provide support every step of the way from daily bookkeeping to financial reporting to preparing tax returns. We have the expertise, credentials, and experience to help your business succeed.